Few people choose to live in Cuyama Valley. With a population of less than 1,000 residents, according to the 2010 U.S. Census, the 300-square mile area is home to large, empty expanses of ranch and agricultural land. Less than a foot of water graces the parched earth of Cuyama each year, making the region one of the driest regions of Central California. Beneath the arid ground, though, there exists great agricultural potential. Cuyama— the Chumash word for “clam”— is an apt analogy for the region. Hardened and seemingly intractable on the outside, it is full of untapped riches underneath. Ever since the region’s oil reserves declined, crops have been king. Harvard Management Company— the stewards of the University’s $37.1 billion endowment— has positioned itself to benefit from the richness of the region. HMC has a long-standing history of owning eclectic natural resource assets, including New Zealand cattle farms, timber, and Brazilian sugar canes. Central California—which boasts some of the world’s finest vineyards—has also become part of HMC’s extensive, and little known, asset portfolio. HMC has offloaded some of its natural resource assets after particularly poor performance in this asset class in fiscal year 2016. In 2017, HMC CEO N.P “Narv” Narvekar—who took the helm of the endowment roughly two years ago—marked down the value of natural resource investments by $1.1 billion. But the company has retained its holdings in California vineyards, and now a number of local residents are questioning the wager Harvard is making in the county. Since 2012, Brodiaea, Inc.—a Delaware-based company wholly owned by HMC—has spent over $60 million and purchased about 10,000 acres of vineyard land in the Paso Robles region of California. Brodiaea followed that purchase by dipping its toes into Cuyama. Harvard’s land grab in central California has raised local concern over the University’s water well drilling and its potential impact on the region. With California confronting a water shortage crisis, residents of Cuyama have begun to band together and draft a vision for a more sustainable future—one that may challenge the vineyards Harvard holds. Bounded to the southwest by the Sierra Madre mountains, Cuyama Valley hugs the Cuyama River and spans four counties in California. Once a hotbed for oil production, Cuyama Valley peaked in the early 1950s as California’s fourth most productive oil region. The oil boom also gave rise to New Cuyama—now the most populated city in the region with just over 500 residents. Once the oil began to dry out, though, farmers started tapping the region for agricultural use. Stephen R. Gliessman, an agroecology professor emeritus at the University of California at Santa Cruz and a farmer in the valley who has challenged the Harvard vineyard’s water usage, said the region experimented with a variety of crops like alfalfa, oats, and carrots. Regardless of the crop, Gliessman said, one issue has persisted across California. As the demand for water increased, the Cuyama Valley Groundwater Basin—the sole source of water supply in the region—began to dwindle in size. A 1998 Department of Water Resource study conducted by the state of California found water levels had dropped 150 feet in the west-central region of the basin and more than 300 feet in the northeastern part of the basin in the preceding 50 years. As groundwater levels decrease, growers have been forced to lower wells reaching up to 1,000 feet in depth, the Santa Maria Sun reported. Recent precipitation data do not offer a bright vision for the future. According to data collected by the Western Regional Climate Center—a government climate research center—New Cuyama has averaged 8.35 inches of precipitation from 1981 to 2010. Between the dry months of April and September, the city sees fractions of an inch in monthly average precipitation. The rest of California has suffered similarly dry conditions. In Jan. 2014, Governor Jerry Brown declared a drought state of emergency in California that lasted more than three years. In the meantime, Harvard has not been deterred by the parched conditions in Cuyama. In April 2014, Brodiaea Inc. paid $10.1 million for more than 7,500 acres of vineyard land in northeast Santa Barbara County, making it one of the biggest holders of land in Cuyama Valley. The vineyard purchase moved local residents to action. Amid the water woes, residents have questioned the viability of Harvard’s vineyards in Cuyama. Randall Tognazzini, whose family has owned a ranch in the northern part of the valley for decades, said he is unsure about the University’s purchase. Tognazzini estimated that 800 acre-feet—or nearly 35 million cubic feet—of water may be needed to grow the vineyard per year. That amount, Tognazzini said, may not be sustainable for Harvard’s vineyard project. “They will make it as perfect as they can, but they can’t guarantee that it’s not going to fail because nature is going to take its course,” he said. Santa Barbara County Supervisor Das Williams said his constituents are wary of the vineyard’s impacts on the valley. “Larger agriculturists, and owners, and the townsfolk, and the farmworkers, and the everyday folks—they have very different viewpoints. The one thing they agree on is that they are afraid of the potential impact and uncertainty that the vineyard project poses,” Williams said. Gliessman said he has heard questions about Harvard’s project since its inception. Brenton Kelly, a farmer in the valley and vice chair of the advisory committee to the Cuyama Basin Groundwater Sustainability Agency, said the land has changed significantly since it became a vineyard. “It’s certainly no longer phenomenal range land with wildflowers and open space," he said. "It's many miles of vineyard now, engineered landscape—much like the rest of the valley." As the valley continues to see its water disappear, its residents have mobilized to preserve it. In Sept. 2014, California passed the Sustainable Groundwater Management Act, which for the first time provided a framework to manage groundwater use in the state. The act instructed the Department of Water Resources to categorize basins based on groundwater metrics. Basins of either “medium” or “high” priority are required by SGMA to form Groundwater Sustainability Agencies that draft Groundwater Sustainability Plans to manage use. Jennifer Clary, a manager at the grassroots environmental advocacy group Clean Water Action, said the law will change the landscape for groundwater use in California. 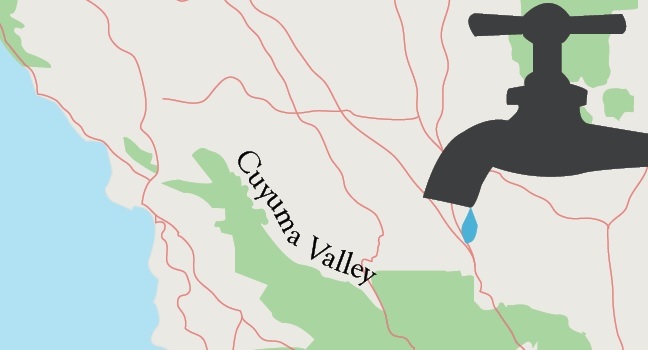 Cuyama Valley, along with 20 other basins, has earned the classification “critically overdrafted.” This means that, over multiple years, more water is withdrawn from the basin than is replenished, and the depletion could have significant adverse impacts. For basins in critical overdraft, the timeline is accelerated and the sustainability plan must be implemented by Jan. 2020. The Cuyama Basin GSA, formed in June 2017, comprises representatives from the Cuyama Basin Water District, the counties that hold land in the valley, and the Cuyama Community Services District, which provides water and wastewater treatment to residents living in the New Cuyama area. The GSA has the power to potentially tax water use, impose restrictions, and fund projects that could increase inflow of water into the valley. To get a seat on the GSA, property owners in the Cuyama Valley formed the water district, which the county certified in 2017. “It was partially formed because the large landowners wanted to be in the driving seat,” Williams said. The special election to form the water district—a group of landowners who will weigh in on water issues—took place in February of last year. The district, which holds a plurality of seats on the GSA, does not include the Harvard-owned vineyard. Harvard is not represented through the district, but rather, through the counties in which the vineyard lies. Williams said it was unexpected to see a major landowner like the vineyard owner sitting out of the process. “We did not anticipate that there would be large entities that didn’t participate with the district,” Williams said, adding he has met with vineyard representatives to ask them to participate directly on the GSA. HMC spokesperson Patrick S. McKiernan declined to comment for this story. The Groundwater Sustainability Agency may end up imposing water restrictions on landowners in the valley, Williams said. And, as one of the most precious resources in the region, restrictions on groundwater could keep Harvard from turning water into wine in Cuyama. “I do believe that the plan could impose restrictions on groundwater uses. It’s one of the most endangered groundwater basins in the state. It’s very possible,” Williams said. In early 2016, Santa Barbara County filed a proposal with the Department of Water Resources that seeks to modify the boundary of Cuyama Valley. Their recommendation cites a recent USGS study that suggests that the Russell fault divides the groundwater basin. The Harvard-owned vineyard has advanced a similar argument. But in June 2016, the DWR rejected the boundary change proposal, which would have split the vineyard away from the critically overdrafted Cuyama Basin. The ruling placed the vineyard under the purview of the Cuyama Basin GSA, meaning any groundwater sustainability plan the group develops will apply to the vineyard. Meanwhile, though, to protect its vineyard from frost, Brodiaea is applying for a permit to construct three reservoirs slated to hold over 52 million gallons of water.